Grab bars are an inexpensive way to prevent falls while providing a safe way to steady yourself when moving in and out of a shower or bathtub. Safety is key when installing a grab bar. It is always preferable to install the grab bar directly into a stud underneath the tile for the increased support a structural member will provide. 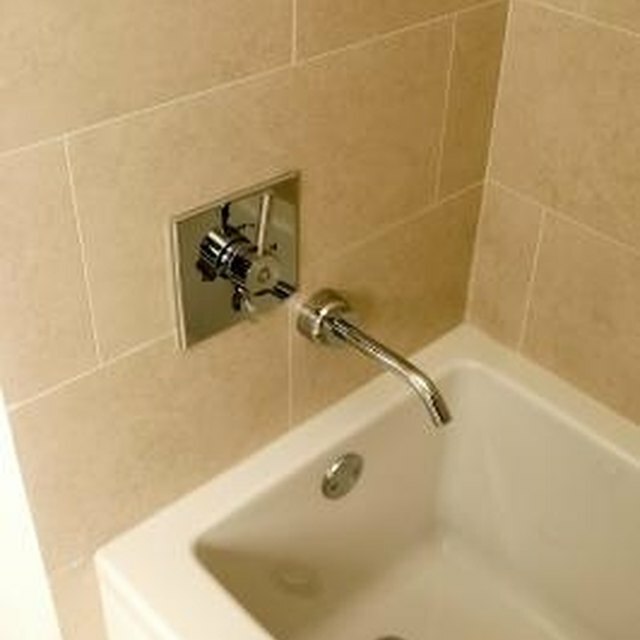 If screwing into a stud is impossible, a hollow wall fastener can be used to install the grab bar and provide support. Locate the area to install your grab bar and look for studs using a stud finder. Mark any studs using a dry erase marker. Use measuring tape to find studs that are spaced to accommodate the length of the grab bar. Mark with a dry erase marker the location of the holes for the screws that will secure the grab bar. Mark directly over existing studs if possible. Set the grab bar ideally 33 to 36 inches above the floor. Use a level to make sure the grab bar will be perfectly parallel when installed. Drill pilot holes using an electric screwdriver fitted with a masonry bit. Screw directly into the stud, or be sure to use a bit that is appropriately sized for the screws that were sold with the grab bar. Drill a 1 1/4-inch hole through the tile using a carbide tip hole saw if you cannot screw directly into a stud. Screw the grab bar into the stud using the screws provided with an electric drill. Skip this step if you are using a hollow wall anchor. Insert the hollow wall anchors, if using, into the 1 1/4-inch holes in the wall. Turn the screw in the center of the hollow wall anchor counterclockwise with a screwdriver until the feet of the anchor expand. Turn the screw in the center clockwise to tighten the hollow wall anchor until it is securely fastened to the hole. Screw the grab bar into the hollow wall anchors with a screwdriver, making sure the holes for the screws are aligned before beginning. Install any decorative pieces included to conceal the screw heads. Measure the distance between studs before purchasing a grab bar as they are available in different lengths. A grab bar that can be installed directly into a stud is always the better choice. Grab bars are often sold with the hardware needed to install them. Be sure to buy the bar with the correct hardware for your bathroom. Be sure to check local building codes before installing a grab bar. While many codes may not apply to private residences, some municipalities require that a grab bar be installed directly into a stud.